One of the biggest problems with the typical treadmill is that it provides quite a shock to the knees during periods of extended use. For those with joint pain, arthritis, and associated stiffness, this can make cardio seem off-limits both at home and at the gym. The good news is that ellipticals provide virtually the same level of cardio training without the constant pounding of feet o the pavement or a treadmill’s base. The Kettler Axos Cross P elliptical machine is a great way for home fitness enthusiasts to bring this essential piece of gym equipment into the home. Its compact size and excellent array of training features allows for endurance training, cardio performance and weight loss, or even high-intensity work that will bode well for long-term health and fitness. This elliptical made it to our top picks for the Best Elliptical Machines of the year. A central LCD screen highlights the chosen level of resistance, the total distance that has been covered while on the elliptical, and even the number of calories burned during the workout. The Axos Cross P comes with a built-in heart rate monitor, which makes it easy to determine whether users are in their target zones for endurance, fat loss, or leisure. Though it’s possible to use the elliptical without a pre-programmed routine, those who prefer a challenge will enjoy access to 12 programmed workouts. The included flywheel weighs over 30 pounds, which allows for a smoother and quieter operation that won’t distract others in the home as a workout winds toward completion. Kettler is a leading manufacturer of ellipticals and other fitness equipment for today’s home gyms, and that shows in virtually every feature of the Axos Cross P. First and foremost, the equipment was designed to be quiet during in-home use, so it doesn’t distract other family members who might be sleeping, watching TV, or socializing with friends and loved ones. That starts with the 30.5-pound flywheel. This heavy weight allows the flywheel to avoid shaking and wobbling, and ensures that the equipment is as quiet as a whisper during even the most intense workouts. Another key feature is the light material weight found in throughout the rest of the elliptical. This allows the equipment to be easily moved without a thud, which is perfect for storage. The Axos Cross P is one of the few pieces of home cardio equipment that comes with a fully featured LCD screen. Located front and center during the workout, the Axos Cross P features calories burned, distance traveled, resistance level set, and other key pieces of information, centrally throughout the activity. The screen also shows the user’s heart rate as they complete their workout, which makes it easy to hit target levels and maximize the burn from start to finish. A dozen preset programs can challenge even the most advanced fitness professionals, while 16 different resistance levels can present a real challenge for those working on their overall cardio endurance and strength. 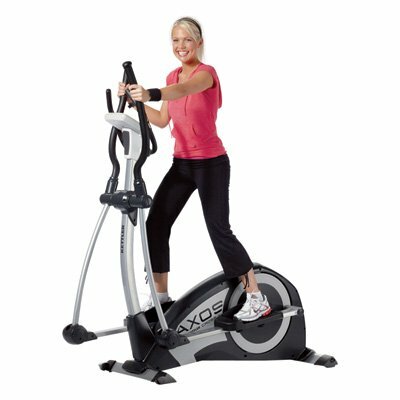 One of the most significant drawbacks noted by current Axos Cross P users is the actual setup and assembly process required after the elliptical is delivered. While there are many people who love by themselves and workout at home, they will probably need to find at least one other person to assist with final assembly of the elliptical. That seems to be the case for two reasons: First, the parts are quite long and unwieldy for most users. Secondly, the elliptical’s heavy flywheel can be a challenge for those who aren’t used to lifting something so large and so heavy on their own. Once assembled, however, most users report that the equipment is far easier to handle, move, and store. Another key problem that some have noticed is that the elliptical doesn’t perform very well on an uneven floor. The unit comes with no inherent stability adjustments, which means it relies on the shape and slope of the floor to find its balance point. If the floor is uneven, the equipment could wobble during use. This is highly rare, however, but still worth considering. Treadmills have long been the piece of equipment most associated with cardio performance, but they just don’t work for many people. In fact, they can even cause or exacerbate injuries. The elliptical is a perfect replacement, and the Kettler Axos Cross P model is excellent for those who need an elliptical of their own in the home. With 12 workouts, 16 resistance levels, a helpful LCD screen, and even a heart rate monitor, this piece of equipment doesn’t lack for features. It’s sure to give both novice users and advanced cardio trainers a workout that will challenge them, contribute to greater fitness levels, and replace the need for a gym membership altogether.